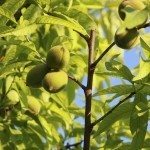 I moved into a new house in June that came with several fruit trees, but I'm afraid two have brown rot (peach trees). Now the biggest concern I have is that the oozing sap appears on the trunk. Am I going to lose my whole tree? Do I cut the thing down and start over? I'm removing mummified fruit and will prune in the spring along with fungicide after blossom fall but I'm terrified my whole tree is doomed.